If you’re a fan of action and senseless violence then this is the comic for you, although I recommend checking out the first comic or watching the first movie to understand the plot beforehand. I do not recommend this to people who are afraid of blood as it is full of it. This comic is darker than its predecessor and you won’t get the usual ending when it comes to normal super hero comics. This comic takes a more realistic approach as opposed to other comics in this genre, because it shows consequences to actions, unlike normal super hero comics where the hero just does whatever he/ she wants to do without having to consider the outcome. 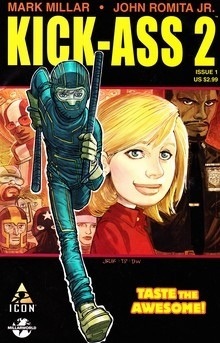 KICK-A$$ 2 takes place a year after the first comic, after Kick-A$$ and Hit-Girl took down the mafia and won. America had its newest sensation: SUPERHEROES. This idea went viral overnight and it became fashionable to put on a mask and a cape. Everyone wanted to be a super hero. So Kick-A$$ took the next logical step: He joined a super hero team. But he wasn’t the only one with big ideas. His former ally, Red Mist set out to become the world’s most notorious super villain aided by his new henchmen. Moreover, Red Mist knows Kick-A$$’s secret identity and he knows where his family lives. He must convince Hit-Girl to come out of retirement to help save both their lives, and when Red Mist brings the fight straight to Kick-A$$, will good win? Or will evil reign supreme?